Ah, the first day of kindergarten. A day I sometimes (ok, often) never thought would arrive, and yet at the same time, it’s arrived far too quickly. 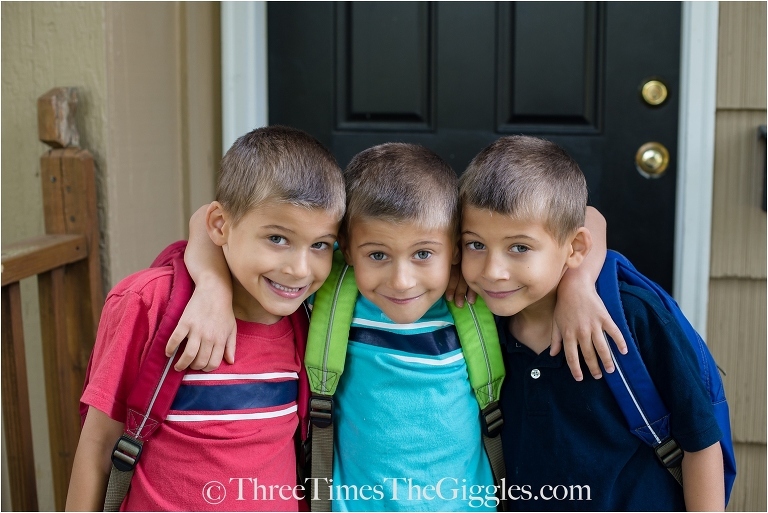 It was rather surreal for Nick and me this morning to drop three little boys off for the first day of school. Doesn’t it seem like just yesterday that I was still pregnant with them, trying to figure out what they’re names would be? Or just yesterday that they were in the NICU, trying their best to grow and learn how to eat and breathe at the same time? Or just yesterday that they were whining in an aisle at Target? Oh wait…. that did happen yesterday! The reality is that these little babies of mine are no longer “babies”. They’ll be 6 in less than two weeks (which is also unbelievable to us), and boy are they ready for school! For those following me on Facebook or Twitter you know a curveball was thrown at us just two days ago in regards to the boys’ classroom placement (they’ve been split up, against our wishes, and at the very last minute). That is a long, drama-filled, tear-filled story, which will be shared in a post all of it’s own. For this one, I want to focus on the actual school day! As far as schools go, we’re lucky enough to have a pretty late start time. School doesn’t start until 8:55am, which means we don’t need to even begin walking down there until after 8:30! SWEET! I’m not a morning person at all (thank goodness Nick is! ), so having more time than most get is pretty awesome in my book. We coached the boys last night on what time we’d need to leave in the morning, picked out their first day of school clothes and laid them out, and Nick told them he’d wake them up at 7am to start the day. Guess who was awake well before 7? And guess who was also ready before 7? Dressed, shoes on, and two of them were even wearing their backpacks already at 6:56am! Their enthusiasm cracked us up! 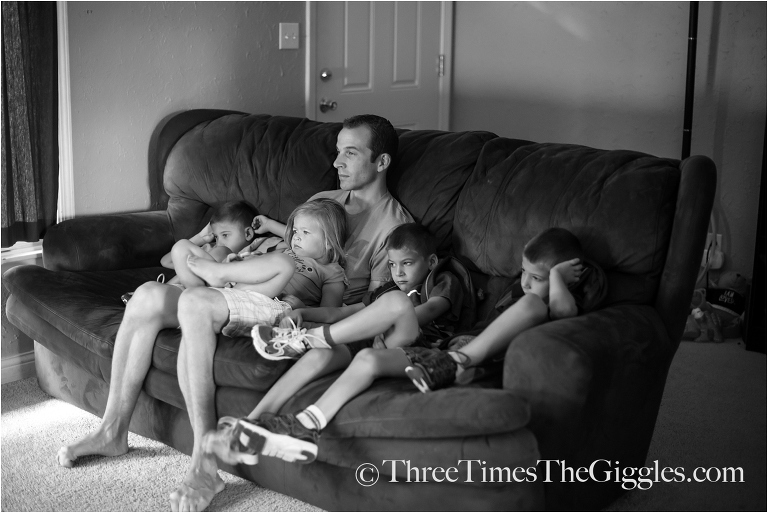 Because they were ready so early, Nick let them all watch Curious George before making breakfast. Then they raced through breakfast! We heard the rare “I’m full!” phrase out of Jackson after only one serving. What?! Who is this kid?! Considering everyone was ready to roll far sooner than we needed to, I dragged them all out onto the front porch for pictures. As you’ll see here, my children have entered the “awkward smile” phase of life. Even children of photographers are not immune to this phenomenon! Aw, my boys! It is no wonder I’ve cried this week. I’ve been so excited for them to start school, and I’m not usually a crier, so I really didn’t think I would cry much at all this week. So wrong! Tuesday night I really lost it for the first time. Granted, that’s also when the drama with the classroom placements had started, but it was also really hitting me at the point that the boys were off on this new adventure, and I was being left at home. I sobbed for probably half an hour on the couch that night, with Nick just holding my hand. Emotional for sure. Thank goodness I have Lily and a business to help keep me distracted and entertained right now, or I think I’d really be floundering. Going from non-stop chaos in your house, to that chaos suddenly being transferred to school from 9-4, 5 days a week is a huge adjustment. Huge! It’s ok that I’ve been crying. It’s been a long 6.5 years of caring for these boys, ever since we found out I was pregnant, and I’m allowed to mourn this life-change, and at the same time be excited for what’s ahead. No tears from the boys this morning, although Ty was looking a bit scared by the time I got to his classroom to take a picture of him at his desk. There was one little boy sobbing and clinging to his mom when we arrived to line up outside the school, and Jackson, Ty and Chase couldn’t understand why. In about an hour I get to go pick my boys up, give them enormous, probably tear-filled, hugs and listen to them excitedly talk over each other about their days. Our babies are growing up. I say “our” because so many of you have been following us since the early days of this blog, and it’s like they’re your triplets too! Our babies are growing up. Awww…I still have another year, and I’m almost crying, reading your post! I’m so sorry you had such drama over classroom placement, but I hope the boys didn’t take that to heart and had an awesome start to their school year.